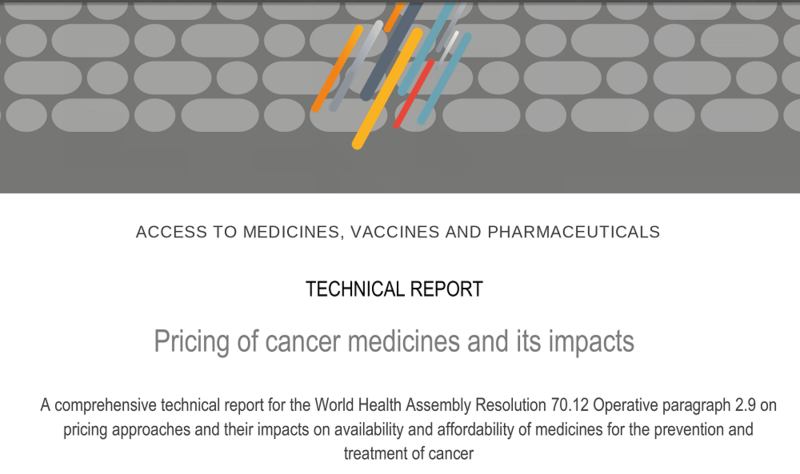 The meeting took place as part of the broader WHO Executive Board meeting in Geneva, and focused on the new WHO report on cancer drug pricing [pdf], recently released by the WHO Department on Access To Medicines, Vaccines and Pharmaceuticals. The Board took note of the report, which now will be taken forward for additional steps. The secretariat highlighted that treatment guidelines for cervical cancer are due to come out soon; guidelines for integrating pain management are coming out this week; the world health report this year will be on cancer; and, in response to requests from some member states, WHO might organise an information session before annual World Health Assembly in May. The report found that the pricing of cancer drugs is disproportionately higher than other types of pharmaceuticals and therapies, and that the price of cancer drugs is continuing to increase at a rapid and alarming rate. At the meeting, member states largely applauded the policy options recommended in the report, and called on the WHO to work closely with member states to ensure that these policies are effectively developed and implemented at national and international levels. Some states also identified the broader applicability of the findings of the report beyond cancer drugs, and the importance of contextualising the issue of drug pricing within broader health systems. Brazil noted that the conclusions of the report can be applied to many other types of diseases. Meanwhile, Germany said that it is important for access issues to not be limited to drug pricing, but to rather be addressed as part of the wider health system, which includes access to diagnostics. Australia then posed the question to the WHO of how these policy options will be “operationalised,” particularly in coordination between countries. Italy called for international action to increase the transparency of R&D costs, and for the WHO to play a stronger role in this regard. Meanwhile, Spain noted that this lack of transparency affects access to innovative medicines for low, middle and high-income countries alike. Portugal declared transparency to be a “fundamental value of modern democratic societies,” and a matter of “good governance,” saying that lack of transparency can lead to corruption. Additionally, Portugal questioned if consumers are paying twice for drugs, due to extensive public sector investments in drug development. On behalf of small island states, Fiji called for the development of improved regional procurement mechanisms to negotiate lower drug prices through economies of scale. This call for collective procurement was further reiterated by Peru. Sudan described the unaffordability of drugs as a “global crisis” that prevents countries from strengthening health systems, and called on the WHO to scale up technical support to identify the most appropriate policy options in the region to address this. The report had come under criticism from the research-based pharmaceutical industry, which said it was not consulted in the preparation of the report (IPW, Health & IP, 23 January 2019), a point raised in the meeting by the United States. Industry also raised concerns about the report findings. Mariângela Batista Galvão Simão, assistant director general for Access to Medicines, Vaccines and Pharmaceuticals at the WHO, responded in the meeting that industry was not consulted in the preparation of the report in order to ensure there was no conflict of interest. Simão noted that the report was prepared by a range of experts and advisers and had gone through consultations. She further added that the report relied on information in the public domain, but that it would have been valuable if the researchers had access to information directly from pharmaceutical companies, such as R&D costs. She then extended an invitation to pharmaceutical companies to provide this information to be included in an addendum to the report. The United States along with the International Federation of Pharmaceutical Manufacturers & Associations (IFPMA) were the most vocal critics of the WHO report on cancer drug pricing at the meeting. The US then called into question the integrity of the cancer drug pricing report, citing the lack of pharmaceutical industry involvement in the preparation of the report. Along with the US, the IFPMA asserted that the report overestimated pharmaceutical return on investment due to “limitations” in its methodology, citing a 2018 Deloitte report [pdf] that found pharmaceutical return on investment to be much lower. Civil society groups reiterated members states’ calls for increased transparency of R&D costs and more equitable access to innovative cancer drugs. In addition, they also voiced strong support for addressing high drug prices by delinking the cost of R&D from the price of medicines, and by making full use of TRIPS flexibilities. The Medicines Patent Pool (MPP) then invited pharmaceutical companies to partner with the MPP, and to voluntarily license priority cancer drugs to enable generic competition and to expand access. KEI then called for “progressively delinking R&D incentives from prices so that efforts to make cancer treatments more affordable do not conflict with innovation objectives,” and invited the WHO to host a meeting to explore the feasibility of delinkage. Health Action International emphasised that the use of TRIPS flexibilities are “legitimate, appropriate and available for every country.” Along with Medicus Mundi International, they called on the WHO to support member states to make use of TRIPS flexibilities, and to “not engage in political pressure” to prevent the use of these tools. Meanwhile, the Union for International Cancer Control (UICC) highlighted that affordable drug pricing will be an important “pillar” towards achieving universal health coverage (UHC) and the Sustainable Development Goals (SDGs). "WHO Member States Call For Transparency, Access To Innovation On Cancer Drug Pricing" by Intellectual Property Watch is licensed under a Creative Commons Attribution-NonCommercial-ShareAlike 4.0 International License.